Manufacturer of a wide range of products which include solar panel mounting structure. 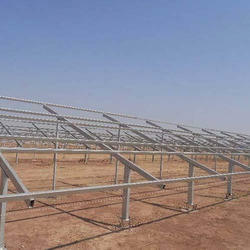 As a renowned organization, we are engaged in offering a wide range of Solar Panel Mounting Structure. Offered products are stringently tested on various quality parameters and are authenticated as per the international standards of quality. These products are resistant to corrosion and ensure long service life. These products are highly appreciated and demanded by our clients due to their high quality and performance.